Has the ability to hold 6 devices up to 14" in size. The Desktop6PLUS is built with military grade aluminum and can handle the roudiest of students. The full aluminum construction allows for a light weight charging station and a natural heat sync to keep devices from over heating during the charging process. By allowing students to manage their own devices, we have been able to cut down deployment time to almost nothing. Classes can start when the bell rings allowing the charging and storage of devices to be a non issue. With the open concept of the Desktop6PLUS, teachers and IT staff now have the ability to immediately see when the devices are missing or when the devices are not plugged in. With the heavy duty rear Stainless steel door, and visual inventory the Desktop6PLUS has maximized security while still retaining an open concept to visually track classroom devices. 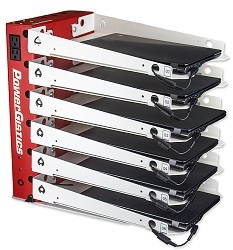 PowerGistics proudly engineers, manufactures and markets all of our products in the heart of Wisconsin. Domestic manufacturing allows PowerGistics to listen to our customers and make changes to enhance the educational experience, quickly. Each desktop tower comes with a fully protected, securely mounted power strip in the back, but you won't have to worry about losing a power source to plug in. The desktop tower has been designed to include an extra outlet on the outside to provide you with an extra charging source for other technology needs. Utilize the eyelet to lock each cable. This allows enough charging cable for the students to plug in their devices, yet locks the cable in place to eliminate loss and damage. With the Cable Eyelet in the rear of the shelf, your cables will remain untangled and secure at the end of each shelf, eliminating warranty claims. Allowing your students and staff to see their assigned device, keeping your classrooms, libraries and common areas neat and organized. Please Note: Devices and Charging Cables shown in image are not included. A wireless display receiver for educators who need wireless display connectivity. The Wireless Display Solution built for Educators! Control your PowerPoint and Keynote presentations like never before! Quickly charges your laptop with boosted energy efficiency by up to 10% on average. Be heard clearly, from opening statements to closing remarks.